WEST PALM BEACH, FL—(Marketwired – Dec 22, 2014) – Forward Industries, Inc. (NASDAQ: FORD) today issued the following open letter to shareholders urging them to stay focused on the core issues that are relevant in the upcoming annual meeting of shareholders scheduled for December 30, 2014 and addressing various false and misleading statements made by Terence Bernard Wise in his campaign to win your vote at all costs. We thank Forward's shareholders, employees and customers who have taken the time to speak with us regarding the future of the Company that will be determined at the upcoming annual meeting of shareholders. We are not alone in wanting the Board's recommended director slate and current management team kept in place to continue building the momentum toward improved performance and maximized shareholder value. As communicated to you in prior letters, the current management team has been working tirelessly to improve shareholder value since 2012. While this endeavor has not been without its challenges, we achieved significant milestones in 2013, including growing sales to more than $30 million from $22 million in fiscal 2011 and returning the Company to profitability for the first time since fiscal 2006. Our articulated plan ahead continues the necessary pursuit of strategic opportunities that will diversify Forward's revenue base and bring the Company into sectors where the Board and management have deep operating experience. We demonstrated the strength of the Board's slate and current management, led by Robert Garrett, who collectively have the requisite public–company and management experience to continue on Forward's current trajectory. Mr. Wise's harmful and distracting election contest threatens to undermine everything achieved for the future of your Company. We have offered to enter into discussions to sell the Company to Mr. Wise at an appropriate premium, but he has always refused. Our last such overture to him was responded to with costly litigation. As a result, Mr. Wise has forced us to allocate significant capital and resources to defend against him in this election contest. Mr. Wise states in his proxy statement that in the event he wins the election, he may seek reimbursement from Forward of all expenses he incurs in connection with the solicitation and that he “does not intend to submit the question of such reimbursement to a vote of security holders of the Company.” We anticipate that shareholders would foot the bill for Mr. Wise's hostile proxy campaign, which as of two weeks ago was already approximately $250,000 solely for proxy expenses. Mr. Wise has four different teams of Skadden and ex Skadden lawyers working out of their New York, Palo Alto and London offices on his proxy campaign and related litigation so we expect his expenses will be a multiple of that reported amount. Don't risk getting stuck paying Wise's legal fees! Wise claims that certain current and former Board members are “affiliates” of Mr. Johnson, suggesting that Mr. Johnson exerts control over the Board and its decision–making process. For the record, Mr. Johnson does not control any other director on the Board. Mr. Johnson and each member of the Board's slate exercise independent judgment on all board matters consistent with fiduciary duties to shareholders. Wise claims that the Board and management have “demonstrated little regard for Forward's core business” and he brazenly attempts to take credit for Forward exiting the retail business “upon [his] initiative.” This is a disingenuous assertion by Mr. Wise. CEO Robert Garrett, who was brought in as a turnaround professional, was instrumental in restructuring a business that was losing about $800K a month in FY12 into a cash flow positive business in FY13. Mr. Wise fought hiring Mr. Garrett — first as a consultant, then as co–CEO and ultimately as the permanent CEO. Instead, Mr. Wise endorsed a retail strategy that resulted in millions of dollars of operating losses until the bitter end when it was obvious that continuing down this path would be extremely detrimental to the business. It is patently false that we exited the retail business upon Mr. Wise's initiative. Wise claims that his sourcing arrangement with Forward produced “the only source of positive financial growth” for the Company. The growth in topline revenue brought the Company back to profitability in 2013. Mr. Wise's assertion that his sourcing arrangement is the “sole” source of Forward's positive financial growth is meritless and, in our view, an offense to our sales team and their exceptional operational support in design, customer service and quality. Our valued sales team and other employees deserve all the credit. Wise claims that the Board is attempting to issue a new series of preferred shares as an “entrenchment tactic” to dilute shareholders. The Board has been consistent in its message regarding its acquisition strategy. We are attempting to address the challenges we face in pursuing additional organic growth by seeking to unlock value through a strategic acquisition. The issuance of preferred shares was solely intended to help finance this acquisition strategy. Mr. Wise's false allegations regarding the share issuance restricted our access to capital markets and blocked our efforts to execute a value accretive deal we negotiated for months. Wise claims that the prior issuance of 6% Senior Convertible Preferred Stock in June 2013 was detrimental to the Company. Mr. Wise voted in favor of the formation of the Special Committee, which had the authority to issue securities of the Company. Mr. Wise's implication that the transaction was somehow nefarious because other members of the Board participated is purely a distraction tactic to be ignored. Board members who chose to participate demonstrated a vote of confidence in the Company. The convertible preferred stock issuance has turned out to be inexpensive financing for the Company. Wise claims that former CFO James McKenna was deliberately terminated to eliminate dissent. Mr. McKenna was terminated as a result of willful misconduct alleged by the Company in ongoing court proceedings in connection with the performance of his duties under his employment agreement. Mr. Wise's assertion that he was terminated to quell dissent is again false. Shareholders are asked to resist focusing on the false arguments published by Mr. Wise in order to win your vote. Recently, Mr. Wise made character attacks against Joseph Mullin. Mr. Mullin is proud of his service as a director of KIT Digital during a period of management turnover and restructuring from 2010 to 2012. This prior experience was one of the reasons he was asked to join Forward's Board. Mr. Wise's allegation that we tried to hide Mr. Mullin's association with KIT Digital is completely false. The directorship is clearly listed in Mr. Mullin's biography on both our proxy statement and website. Mr. Wise's character attack against Robert Neal and his involvement with Concurrent Computer Corporation is cut from the same cloth. Mr. Neal's activist campaign at Concurrent was instrumental in leading to a reconstitution of its board, the first common dividend in Concurrent history and the termination of its poison pill that had been in place for 20 years. Mr. Neal and his team pursued these goals with the best interests of all Concurrent shareholders in mind while minimizing disruption to Concurrent's core business. Concurrent shareholders have enjoyed robust returns on their investment for three years after more than a decade of significant losses. Concurrent common stock currently has among the highest common stock dividend yields among U.S.–listed equities. Mr. Neal is a highly–qualified director whose interests are clearly aligned with all shareholders by virtue of his personal investment of significant capital in the Company. Mr. Neal has put money into Forward while Mr. Wise and Ms. Yu have taken millions in fees out of the Company. As we approach the Annual Meeting, we intend to continue to publicly respond to Mr. Wise's false statements and character attacks so that all shareholders can make an unbiased and fully–informed decision regarding the future leadership of Forward. Your vote is important, no matter how many shares you own. We urge you to sign, date, and return the enclosed WHITE proxy card today. 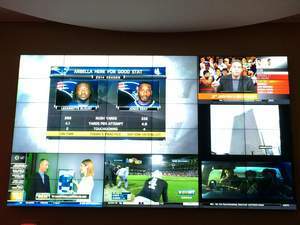 BOSTON, MA—(Marketwired – Dec 22, 2014) – Installation of Boston's largest indoor bar or restaurant video wall is complete at Champions sports bar at Boston Marriott Copley Place, just in time for the NFL playoffs. Guests at the popular Boston Back Bay restaurant can now catch the games on an LED–backlit ultra–narrow bezel, professional–grade large screen display, that measures 11.5–feet high by 20–feet wide, and projects a picture–perfect image, or sets of images, over a span of 230 square feet. The NECX464UN display is built with a total of 36 46–inch LCD TVs in a 6×6 format, which offers a perfect aspect ratio and sets a new standard for video walls. Measured diagonally, the video wall is equivalent to a 276–inch (or a 23–foot) television. A single image can be displayed across the full display, or the display can be divided into four, five or six images shown simultaneously. Advanced technologies of this model include direct LED backlighting for improved uniformity, full high–definition resolution (1920 x 1080) and a 5.7mm distance bezel width. Champions restaurant in Boston's Copley Place also features 40+ HD screens, superior sound system, wireless internet access, a modern American grill menu, full bar with handcrafted cocktails, 20+ local craft beers, and 36 draft lines. Conveniently located at 110 Huntington Avenue in the heart of Boston's Back Bay, Champions is perched on the second level of the Boston Marriott Copley Place. For the latest sports news, trivia and updates, like “Champions Boston” on Facebook, or follow @ChampionsBoston on Twitter. A standout among other hotels in Copley Square, the award–winning Boston Marriott Copley Place is centrally located in the Back Bay district of the city. Just minutes from historic Trinity Church and Boston Common, the downtown Boston hotel's location is perfect for business, weekend and leisure travel. Local shopping destinations include the stylish boutiques of Newbury Street, Copley Place Mall, and the Shops at Prudential Center, while nearby sporting venues make it easy to cheer on favorite teams at Fenway Park or TD Bank Garden. As guests of this premier Copley Square hotel in Boston, travelers are pampered with upscale amenities and on–site services including Champions sports bar and restaurant, valet parking, car rental and tour desk. Featuring 70,000 square feet of flexible, high–tech event space, this exceptional destination is a leader in style and service making it ideal for Boston conventions, business meetings and events. 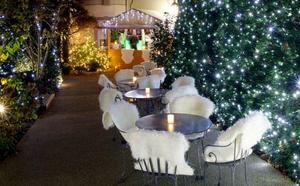 PARIS, FRANCE—(Marketwired – Dec 22, 2014) – Transforming its private garden into a winter wonderland in the heart of Paris, the Renaissance Paris Le Parc Trocadero Hotel is welcoming guests to experience the joys of winter with added flair. Dazzling lights amidst the greenery of rare plants from around the world and 'snow'–covered chairs would imply the need for mittens and hats, but the Eiffel Tower hotel's private outdoor event venue is warmer than it might first appear and the food and beverage that accompany this wintertime Paris festival is a delight. Surrounded by four buildings, the garden venue's existence in Paris, France is one of the city's hidden gems, but now through the end of February 2015, this tropical paradise is reflecting the atmosphere of a winter resort where visitors will find themselves surrounded by the comforts of fine fare and grand libations for a warm wintry experience. All day, the chalet–bar will display a gourmet card that will revisit the great Classics as the head bartender and his creative team serve hot chocolates (black, milk, white) prepared directly from cocoa beans and offerings of Pinot noir. Located between Champs Elysées Avenue and the Eiffel Tower, the hotel venue is an impressive destination for holiday parties and personal celebrations. For more information on hosting an event, contact the sales team at Leparc.sales@renhotels.com or +33(0) 1.44.05.66.40. The Renaissance Paris Le Parc Trocadero Hotel intrigues guests with historic charms, intuitive service and impeccable accommodations to create a remarkable five–star hotel experience. Conveniently located within walking distance of the popular Champs–Elysees Avenue, guests can easily enjoy world–class shopping, fine dining and cultural attractions from this distinctive Paris destination. Spacious guest rooms and suites, some with views of the Eiffel Tower, feature high–tech amenities, flat screen TVs with International cable/satellite service, premium movie channels, high–speed wired and wireless Internet access, luxurious bedding ensembles and 24–hour room service. Located in the heart of one of Paris' most charming districts, Le Parc Trocadero also features more than 3,000 square feet of event space perfect for hosting inspirational business conferences and elegant social gatherings. The Board and PIMCO believe that there will be significant benefits to consolidating the Funds' fiscal year ends in the manner described above, including, among other benefits, significant increases in efficiencies for the Funds, the Board and PIMCO. In connection with the changes to their fiscal year ends discussed above, RCS, PDI, PGP, PHK, PFL and PFN have also announced that they expect to hold their next annual meetings of shareholders on June 30, 2015, which differs from the dates that were contemplated in each such Fund's proxy statement for its most recent annual meeting of shareholders. This date is subject to change by the Funds' Board of Trustees/Directors. Please refer to RCS', PDI's, PGP's, PHK's, PFL's or PFN's notice of meeting, as applicable, which will be included in the proxy statement for such Fund's next annual meeting, when available, for final information on each such Fund's shareholder meeting. Proposals of shareholders intended to be presented at the June 30, 2015 annual meetings of PGP, RCS, PDI, PHK, PFL or PFN must be received by the relevant Fund no later than February 17, 2015 for PGP or RCS and no later than March 2, 2015 for PDI, PHK, PFL or PFN for inclusion in such Fund's proxy statement and proxy cards relating to that annual meeting. The submission by a shareholder of a proposal for inclusion in a Fund's proxy materials does not guarantee that it will be included. Shareholder proposals are subject to certain requirements under the federal securities laws and must be submitted in accordance with the applicable Fund's Bylaws. Shareholders submitting any other proposals (including proposals to elect Trustee/Director nominees) for a Fund intended to be presented at such Fund's next annual meeting (i.e., other than those to be included in the Fund's proxy materials) must ensure that such proposals are received by the relevant Fund, in good order and complying with all applicable legal requirements and requirements set forth in such Fund's Bylaws. Accordingly, such proposals must be received no earlier than April 18, 2015 and no later than May 3, 2015 for RCS or PGP and no later than May 16, 2015 for PDI, PHK, PFL or PFN. If a shareholder who wishes to present a proposal fails to notify the relevant Fund by the dates described above, the proxies solicited for that annual meeting will be voted on the shareholder's proposal, if it is properly brought before that annual meeting, in accordance with the judgment of the persons named in the proxy card(s) for that annual meeting. If a shareholder makes a timely notification, the proxies may still exercise discretionary voting authority under circumstances consistent with the Securities and Exchange Commissions' proxy rules. Shareholder proposals for the upcoming annual shareholder meetings should be addressed to the attention of the Secretary of the applicable Fund, 1633 Broadway, New York, NY 10019, with a copy to David C. Sullivan, Ropes & Gray LLP, Prudential Tower, 800 Boylston Street, Boston, Massachusetts 02199–3600. The next annual meetings of shareholders for the Funds other than PDI, PHK, PFL and PFN are expected to be held within thirty days of the anniversary of their most recent annual meetings. The pace of retail continues to accelerate through an increase of social and digital channels, the explosion of data, and the rise of customer expectations. Today's retailers are faced with creating differentiated shopping experiences to remain competitive. Oracle is uniquely qualified to help retailers with its combination of integrated solutions. In order to help Oracle continue its leadership in this important sector, Jill Puleri will join as Senior Vice President and General Manager, Oracle Retail. Oracle today announced the appointment of Jill Puleri as Senior Vice President and General Manager, Oracle Retail. Puleri will be responsible for leading the Oracle Retail Global Business Unit and report to Mike Webster, Oracle's Senior Vice President and General Manager, Retail and Hospitality. Having held various leadership positions in sales, marketing and consulting, Puleri brings over 20 years of experience and deep domain expertise in the retail industry, most recently serving as the Worldwide Retail Industry Leader for IBM Global Business Services. ROSELAND, NJ—(Marketwired – Dec 22, 2014) – ADP®, a leading global provider of Human Capital Management (HCM) solutions, today applauded the enactment of provisions of the Small Business Efficiency Act, which were included as part of the Tax Increase Prevention Act of 2014 and signed into law on December 19, 2014. The legislation, which received broad bipartisan support, amends the Internal Revenue Code to establish a certification program for Professional Employer Organizations (PEOs). The Act codifies the authority of certified PEOs to pay wages to worksite employees and to collect and remit payroll taxes for those wages. “This is a landmark piece of legislation that will boost the confidence small and midsized businesses can have in their PEO partners,” said Maria Black, president of ADP TotalSource®. ”We welcome IRS certification of qualified PEOs, as not all PEOs participate in industry accreditation and financial assurance programs, such as the Employer Services Assurance Corporation (ESAC), the way ADP TotalSource does. This law sets clear rules and sends a signal that PEOs must adhere to high standards so their clients can enjoy the advantages of the PEO model,” Black added. Once effective, the law will grant certified PEOs successor employer status for FICA and FUTA taxes, eliminating the double taxation that can occur from a wage base restart when a client joins or leaves a PEO mid–year. The Act also confirms that clients of a certified PEO, rather than the PEO itself, can claim certain tax credits related to employment taxes, such as the Work Opportunity Tax Credit. To qualify for IRS certification, PEOs will have to adhere to specific bonding and independent financial review requirements, and certified PEOs will also have ongoing reporting and recordkeeping responsibilities. The Act directs the IRS to establish the voluntary PEO certification program prior to the law's anticipated effective date of January 1, 2016. ADP TotalSource is a comprehensive business process outsourcing solution from ADP, a leading provider of human capital management services. As a PEO, ADP TotalSource provides small to midsized organizations with an end–to–end human resource solution including guidance from a dedicated HR business partner, compliance assistance with the Affordable Care Act, a flexible human resource management system (HRMS), FORTUNE 500®–caliber benefits and a workers' compensation insurance program. The cloud–powered, mobile–enabled HRMS provides employers and employees on–demand access to a broad array of critical human resource tools and access to services and benefits including talent management, risk management, compliance, health insurance, 401(k) retirement savings plan and other employee benefits solutions. In addition, by virtue of a co–employment relationship, small to midsized organizations share responsibility for minimizing employment risk with a world authority on employment. SAN MARCOS, TX—(Marketwired – Dec 22, 2014) – Thermon Group Holdings, Inc. (NYSE: THR) (“Thermon”) today announced that one of its wholly–owned subsidiaries has entered into an agreement (the “Transaction”) to acquire certain assets and assume certain liabilities of Unitemp cc (“Unitemp”). Thermon expects the Transaction to close in spring 2015. Unitemp is an ISO 9001:2008–accredited designer and supplier of heating, sensing, portable instruments, monitoring and control solutions serving the Sub–Saharan Africa market. Unitemp is headquartered in Cape Town, South Africa, with a branch location in Johannesburg, South Africa. Unitemp generated annual revenue of 90 million South African Rand (approximately $8 million US Dollars at the current exchange rate) in its most recently completed fiscal year. The current Unitemp management team will continue to operate the business following the closing of the Transaction. “The acquisition of Unitemp represents an attractive opportunity for us to extend our global footprint to include the African continent, enhance our ability to serve our global customers and expand our presence in the Sub–Saharan Africa market. The acquisition is consistent with our strategy of pursuing organic and inorganic growth opportunities within our core business. Unitemp has been a valued channel partner of Thermon for many years and we look forward to welcoming the employees of Unitemp into the Thermon family,” said Rodney Bingham, President and Chief Executive Officer of Thermon. “Unitemp has successfully and consistently grown over the last 20 years. We have reached a point in our development where an outside partner will be able to help accelerate future growth, particularly as it relates to the range of project opportunities that lie ahead. We are excited to be partnering with Thermon, and we expect to strengthen our product ranges, expand our services and become a stronger partner to our valued customers,” said Hans Hitzeroth, Chief Executive Officer and Member of Unitemp. This release may include forward–looking statements within the meaning of the U.S. federal securities laws in addition to historical information. These forward–looking statements include, without limitation, statements regarding our industry, business strategy, plans, goals and expectations concerning our market position, future operations, margins, profitability, capital expenditures, liquidity and capital resources and other financial and operating information. When used, the words “anticipate,” “assume,” “believe,” “budget,” “continue,” “could,” “estimate,” “expect,” “intend,” “may,” “plan,” “potential,” “predict,” “project,” “will,” “future” and similar terms and phrases are intended to identify forward–looking statements in this release. Forward–looking statements reflect our current expectations regarding future events, results or outcomes. These expectations may or may not be realized. Some of these expectations may be based upon assumptions, data or judgments that prove to be incorrect. In addition, our business and operations involve numerous risks and uncertainties, many of which are beyond our control, which could result in our expectations not being realized or otherwise materially affect our financial condition, results of operations and cash flows. Actual events, results and outcomes may differ materially from our expectations due to a variety of factors. Although it is not possible to identify all of these factors, they include, among others, (i) general economic conditions and cyclicality in the markets we serve; (ii) future growth of energy and chemical processing capital investments; (iii) our ability to deliver existing orders within our backlog; (iv) our ability to bid and win new contracts; (v) competition from various other sources providing similar heat tracing products and services, or alternative technologies, to customers; (vi) changes in relevant currency exchange rates; (vii) potential liability related to our products as well as the delivery of products and services; (viii) our ability to comply with the complex and dynamic system of laws and regulations applicable to international operations; (ix) a material disruption at any of our manufacturing facilities; (x) our dependence on subcontractors and suppliers; (xi) our ability to obtain standby letters of credit, bank guarantees or performance bonds required to bid on or secure certain customer contracts; (xii) our ability to attract and retain qualified management and employees, particularly in our overseas markets; (xiii) our ability to continue to generate sufficient cash flow to satisfy our liquidity needs; (xiv) the extent to which federal, state, local and foreign governmental regulation of energy, chemical processing and power generation products and services limits or prohibits the operation of our business; and (xv) other factors discussed in more detail under the caption “Risk Factors” in our Annual Report on Form 10–K for the fiscal year ended March 31, 2014, filed with the Securities and Exchange Commission on May 30, 2014. Any one of these factors or a combination of these factors could materially affect our financial condition, results of operations and cash flows and could influence whether any forward–looking statements contained in this release ultimately prove to be accurate. NEW YORK, NY—(Marketwired – Dec 22, 2014) – Cat Schwartz, the Hi–Tech Mommy, shares a few last minute tech gift ideas. This season, you can actually give the gift of savings and help someone on your shopping list cut their cell phone bill in half. Straight Talk Wireless has no–contract–plans with $45 unlimited talk, text, and data. Plus, switching to Straight Talk Wireless is easier than ever, since there are no contracts, no credit checks, and most importantly, no surprises. The best part is their Bring Your Own Phone option, so you can keep your new iPhone 6 when you switch. This next gift is the camera re–imagined. It's the RE from HTC. By simply picking it up, it turns on and is ready to shoot. It takes high–quality photos, videos, works underwater and can pair directly with both your Android and iOS devices so you can see what RE sees. Set down the camera and let it capture the moments! Everything is instantly stored on your phone and backed up to the cloud, making it perfect for sharing anywhere. Did you know that 8 out of 10 people suffer from back pain? This means you likely know someone who would love Valedo. This is a personal medical device that takes exercises — like the ones you would do with a physical therapist — and puts them into fun, interactive games on your devices. You're guided through these virtual “worlds” while moving your body in ways that restore joints and redevelop muscles. It makes a great gift because it's a cool new technology that's portable and can actually help make your back healthier. Visit www.valedotherapy.com to purchase for 10% off before Christmas. This gift is the perfect gift for anyone who wants to stay charged all year long. eBay collaborated with six of today's biggest designers to create a limited–edition collection of mobile chargers. Great for on–the–go charging, each bank has a customized print based on what inspired the designer this season. These are available exclusively at eBay.com/holidaycollective for only $25, and all proceeds benefit the Council of Fashion Designers of America. And, eBay has everything you need and love this holiday with great deals on this season's must–have items. This release is provided by YourUpdate.tv for whom Cat Schwartz is a spokesperson on behalf of the organizations referred. NEW ROCHELLE, NY—(Marketwired – Dec 22, 2014) – Somnia Anesthesia, a national anesthesia practice management company, along with Physician Hospitals of America (PHA), has recently published a new webinar titled, “The Next Paradigm in Medicine: ACA Health Care Demands Change Delivery,” discussing the possible effects of the Affordable Care Act on future healthcare delivery. This new webinar profiles the current market and presents compelling trends that may predict changes in demographics, insurance coverage and healthcare providers over the coming five years. “Changing U.S. demographics and the impact of the Affordable Care Act will present major demands on health systems over the next five years,” says Dr. Marc Koch, Somnia Anesthesia's CEO and President. The webinar was first released on Tuesday, December 9, but you can download a recording from the Somnia Anesthesia website. Somnia Anesthesia optimizes anesthesia services for healthcare facilities throughout the country by combining clinical excellence with unparalleled management acumen. Owned and operated by anesthesiologists since 1996, Somnia provides a turnkey, solutions–based approach to anesthesia management. 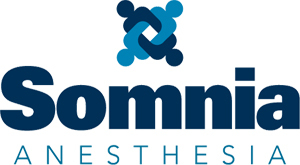 With an extensive in–house infrastructure and a single–minded focus on anesthesiology, Somnia builds and manages local anesthesia teams that consistently deliver the highest quality patient care, enhance operating room performance, increase revenues, and achieve full surgeon and patient satisfaction. For more information, visit www.somniainc.com. SAN JOSE, CA—(Marketwired – Dec 22, 2014) – Elastica (www.elastica.net), the leader in Data Science Powered™ Cloud Application Security, has been named a finalist in the 2014–2015 Cloud Awards Program in the “Security Innovation of the Year” category. With awards for excellence and innovation in cloud computing, the cloud computing awards program accepts entries from across the entire globe, including the US, Canada, Australasia and EMEA. Now in its fourth year, entries are accepted from organizations of any size, and include start–ups and government bodies. Elastica was recognized for its significant expertise in applying deep machine learning and data science to further the advancement of the Cloud Access Security Broker space. Elastica is the leader in applying world–class data science and machine learning to the challenge of monitoring and securing enterprise assets in the cloud. It's easy–to–use CloudSOC solution delivers unprecedented visibility into the use of cloud applications, detects intrusions and threats in real–time, protects against compliance violations and data leaks and supports effective incident response with detailed analysis of application activity. The Cloud Awards is an international program which has been recognizing and honoring industry leaders, innovators and organizational transformation in cloud computing since 2011. The awards are open to large, small, established and start–up organizations from across the entire globe, with an aim to find and celebrate the pioneers who will shape the future of the Cloud as we move into 2015 and beyond. Categories include the Software as a Service award, Most Promising Start–Up, and “Best in Mobile” Cloud Solution. Finalists were selected by a judging panel of international industry experts. For more information about the Cloud Awards please visit http://www.cloud–awards.com/. Elastica is the leader in Data Science Powered™ Cloud Application Security. Its CloudSOC™ platform empowers companies to confidently leverage cloud applications and services while staying safe, secure and compliant. A range of Elastica Security Apps deployed on the extensible CloudSOC™ platform deliver the full life cycle of cloud application security, including auditing of shadow IT, real–time detection of intrusions and threats, protection against intrusions and compliance violations, and investigation of historical account activity for post–incident analysis. Learn more about Elastica at http://www.elastica.net.